Britain has had its share of architects through the ages who have brought their vision and insight to the buildings they have designed so that we now after all these years can still bask in their glory and wonder at how these truly spectacular buildings ever came to be. Here we look at some of Britain’s most famous architects. Christopher Wren, son of Christopher Wren the dean of Windsor, was born in 1632. His father was the King’s chaplain so therefore spent much of his formative years living in and around Windsor Castle where he was clearly enthused and encouraged by the architecture there. Wren was an accomplished scholar and a brilliant scientist but his main interest was architecture and after visiting Rome he was intent on creating buildings similar to those he had seen on his travels. On the 2nd of September 1666 the Great fire of London took hold and destroyed many buildings in a large area of the city and the king, Charles II, who had been a childhood friend, commissioned Wren to rebuild the destroyed city buildings. This task included the building of fifty churches and St. Paul’s Cathedral which itself took thirty five years to complete. 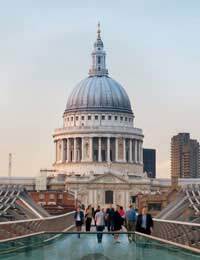 The Cathedral is situated on Ludgate Hill – where a place of worship has taken residence since the year 604AD – and was completed when Wren was sixty. He died in 1723 and was the first person to be buried there. To this day the beauty and awe of the building still makes it one of Britain’s finest and well known pieces of architecture. Norman Foster was born in Manchester in 1935. The son of a shop manager he was brought up in a downtrodden area of Manchester and after leaving school he completed four years national service before returning home to work as a baker. At the age of 21 he was awarded a fellowship to Yale University where he gained a masters degree in Architecture. In 1967 Foster and his wife formed Foster Associates and have gone from strength to strength. Foster’s designs are not just visible in and around London but also in Germany (the Reichstag Parliament Buildings), Hong Kong (Chek Lap Kok Airport), and the US (Spaceport America). In the United Kingdom he is responsible for designing Queen Elizabeth II Great Court at the London Museum, the Canary Wharf Underground Station and the Millennium Pedestrian Bridge over the River Thames. Charles Rennie MacIntosh was born on the 7th of June 1868 in Townhead, Glasgow. By 1889 he was an architectural apprentice who was taking evening classes to boost his knowledge and it wasn’t long before he was winning awards and embarking on architectural tours of Italy. On his return from Italy he designed the Glasgow Herald Building, which was one of the first buildings to have a hydro-pneumatic lift; something that, for its time, was relatively unheard of. There are many places in Glasgow that were designed by MacIntosh and to this day still command vast audiences from all around the world who look on in wonder at this architectural prowess. These buildings include The Glasgow School of Art, Scotland Street School Museum, Martyr’s Public School and The Hill House, which is now owned by the National Trust.